We’ve been working on proposals for an exciting residential project at a property and grounds by the River Thames in Goring. 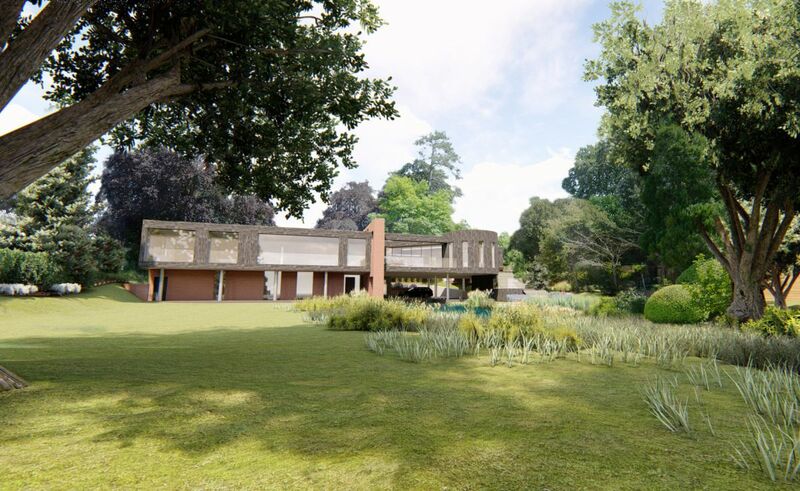 The existing house on the site is a former tennis pavilion, which our client would like to replace with a modern five-bed home that makes the most of its idyllic surroundings. Influenced by the river and tranquil setting, our designs and proposed landscaping (by Greenhalgh LA) bring the Thames further into the site via a short inlet. Sitting on stilts (due to complex flood risk constraints unique to this site), the simple lightweight timber-clad building is cantilevered over water and landscape to blur the boundaries between them. With water lapping underneath, the property reaches out towards the river and offers views that are not currently possible. Our interior designs include an open plan approach, with windows and terraces overlooking the garden. The waterside snug is an important link between the building and garden, and a new boathouse straddles the inlet. Local materials reflect the property’s setting and are driven by the context. Sustainability plays an important part in the design, with open water and ground source heat pumps, new ecological habitats, and an air-tight construction for the building. With the landscape creating a real sense of place for the new home nestled within it, our clients will be able to take full advantage of the property’s riverside setting and enjoy it to the full.